Soak the cashews and badam in milk for 30 mins. In a wide pan add a tsp. of ghee pour the grinded paste. Now add the grinded coconut paste and cook for bout 5 - 10 mins. Finally add the cream and the paneer cubes along with salt,mix them gently .when it boils switch off the flame. 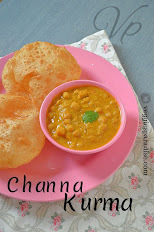 This looks very creamy and delicious, a perfect side dish with roti's. I love paneer and this looks so tempting! Wow the gravy looks so creamy and rich. Perfect to have this with nan. I noticed that you have not used cardamom in the recipe for the Qurma/Kurma; any special reason? Super yummy Kurma..looks creamy and perfect. 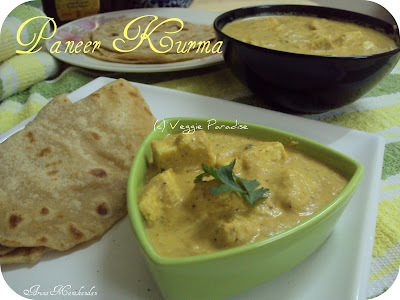 Paneer kurma is looks so tasty and delightful... 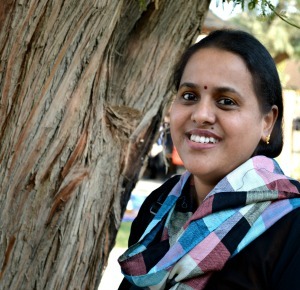 Wonderful clicks and love the green theme in ur pic!! Sounds yummy and am sure it will be a perfect side dish with rotis naans and all ryt? rich n creamy n delicious..loved it! The gravy looks so rich and yummy..
yummmmmmmmmmmmmmmy and mouth watering kurma. I am drooling over your last pic..Paneer kurma looks so rich and creamy..Yum Yum!! Rich looking kurma, soo inviting..
looks delicious..luved the idea of using coconut,badam and cashews all together for paste...very rich and creamy indeed...bookmarked ! Rich and delicious kurma. Looks so nice. This will go very well with hot puffed pooris, would love to try this. 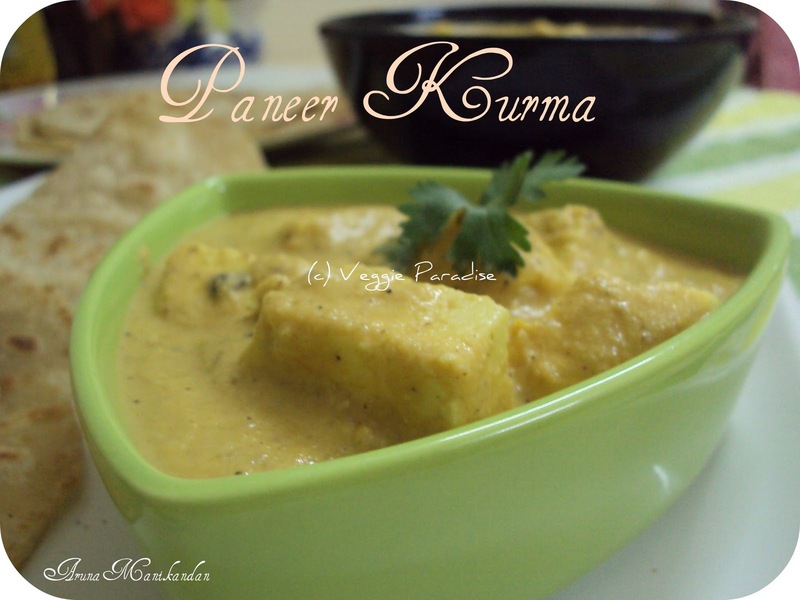 Kurma with paneer sounds exotic. The gravy looks creamy and perfect..
Creamy and yummy kurma,my kid luvs it..
looking so inviting and yummy! Looks delicious and rich. Nice paneer dish. Looks delicious.. Love the pictures.. Thanks for sharing..